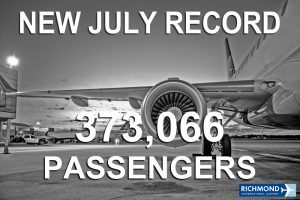 At the August meeting of the Capital Region Airport Commission, Richmond International Airport (RIC) reported a new monthly record for the tenth consecutive month as 373,066 travelers transited the facility in July 2018, topping the previous mark of 337,474 set in July 2007. In July, the Airport saw a 12.4 percent year-over-year passenger traffic increase. Delta was the market share leader in July at 33.9 percent, followed by American (28.2 percent) and United (16.0 percent). Spirit, a new-entrant carrier with service to Orlando and Ft. Lauderdale, captured a four percent share of passenger traffic. Additionally, Allegiant, offering twice-weekly service to three cities, reported a 52 percent increase in its passenger count with the addition of new service to Nashville (BNA). For the first seven months of calendar year 2018, passenger traffic at RIC is up 10.2 percent. Total cargo, measured as a sum of freight and mail, increased 5.3 percent in July over the same period last year to 11.0 million pounds. Aircraft operations saw a 4.5 percent increase during the month, with air taxi (+9.8%), air carrier (+5.7%), and general aviation (+4.0%) operations all reporting year-over-year growth. For the calendar year, aircraft operations are up 5.7 percent. View the monthly aviation summary here: https://flyrichmond.com/airport-information/#monthly-statistics. In the first month of fiscal year 2019, operating revenues totaled $4.2 million, greater than budget by $215 thousand (6%), with parking and concession revenue reporting higher than expected. Operating expenses for the same period amounted to $2.1 million, less than budget by $137 thousand (7%). Per recent schedule updates, Allegiant has extended twice-weekly seasonal Richmond-Nashville service through February 2019. The Commission re-affirmed its policy to waive fuel flowage fees for general aviation aircraft fueling at RIC’s fixed base operators (FBOs) during the upcoming NASCAR race week, September 17-24, recognizing that NASCAR race weeks contribute a substantial boost to the local economy and RIC is clearly the best-positioned facility to support the arrival of corporate and other general aviation aircraft associated to major motorsports events at Richmond Raceway. The Commission authorized Jon Mathiasen, AAE, president and CEO, to negotiate and execute a construction agreement with Branscome Incorporated for the $1.7 million East General Aviation Ramp 3 Expansion Project. In August, Richmond International Airport was re-certified as a Virginia Green Travel Partner by the Virginia Green Travel Alliance, a non-profit organization that administers the Virginia Green certification program and works to promote sustainable tourism statewide. The Airport was originally certified in September 2015. For more information, please visit www.VirginiaGreen.net. The Airport Minority Advisory Council (AMAC) recognized Mathiasen with a Hall of Fame award at its 34th Annual Airport Business Diversity Conference in Seattle on Friday, August 24, 2018. For more information about AMAC, please visit www.amac-org.com.